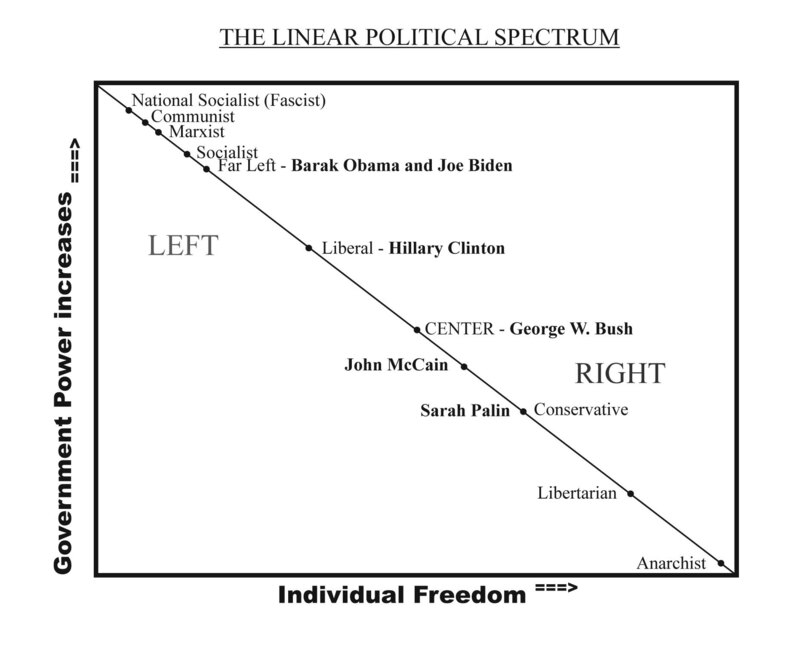 Here is the placement of the 2008 crop of presidential politicians as they are plotted on the spectrum. National Defense: Obama is weak on defense. He proposes more government as the solution to all problems which identifies his political position. He is located near the ¾ mark when describing the spectrum from the center to the left at the far side of the left or modern-day liberal side. That is alarmingly near and in the solid direction of the position of dictators and communists and firmly ensconced in Socialism. All of those positions are historical examples of failed transfer of power policies that give power and control to the government and take it away from the people. It is also interesting and very telling that Obama uses a communist slogan of “Yes we can!” in his campaign. His program is to promise you benefit and deliver disaster, not unlike National Socialists did. You know them as Nazis. Read how they got started by increasing both government and taxes, especially on businesses. In the end they always implode because their programs just do not add up to success for the masses as they require other peoples money which runs out, really only providing power for the few in charge. Moslem Support.Does it not tell you something that the Moslem extremists of the world are ecstatic that Obama is running for the US presidency? That is because they know he will weaken the US domestically and defensively. These are the people who ridicule our love of freedom. Look at where all of the anti-Americans line up, domestic and foreign: right behind Obama. Just the fact that Obama is running for President of the United States provides comfort and excitement to our enemies especially the Moslem extremists who are nothing short of ecstatic. Line up his far leftist position vs. the Moslem fascists and take a look at the proximity of the two positions. This narrow separation explains the jubilation of the Islamic extremists over Obama’s candidacy. Obama’s foreign policy is based upon his wishes, not meeting the opposition squarely and with firmness. He would be run over while sitting and engaging in dialogue. He might wish that the opposition government would discuss matters truthfully and with sincere intentions – but many won’t. He might wish that they wouldn’t lie to him or us – but they will. They will mislead us because they have their own self-interest at heart. Not ours interests, instead many will have only our destruction in mind. They are completely without our morals. The desired peaceful resolution of differences is preferred but Utopian and unattainable. Everyone has a different character, and that character has to be met appropriately. To do so requires multiple levels of response and the ability to meet and defeat them at any level of response. Obama is an extremist with radical tendencies and is not the best one for us to hire to promote harmony and consensus at home. Obama is the last one in the US senate to embrace centrist policies let alone reach across the aisle. His policies and record align him with the communist/socialist/Marxist political positions. As such he represents a political philosophy that embraces some of the most severe threats in the entire history of the world. Those threats include the National Socialism of the Nazis as well as the Communists governments of Russia and China and places all around the World where they killed hundreds of millions of people, including their own. Obama may very well be ignorant of this fact but you don’t have to be and you need to help stop him. The Leftist “force” which seeks to gain even more strength must be stopped and the direction reversed. If you care about your neighbors and your country you will help defeat the pull in this vert wrong direction and help to reverse the trend. Do you really want to change toward the far left instead of toward the benefits of the right? National Debt: Obama Proposes spending 10 times his proposed new income. And his income is overstated because tax increases often have the opposite effect, stifling business, reducing the nations income. Lawyers: Consider the professions of the candidates. From our research we lean toward the opinion that a lawyer is not the best choice for a political candidate, the same way that a lifelong politician who has no other “real world” experiences to draw upon are not the best choice by a long shot. Studies have shown that politicians who did nothing else prior to being in office then went to work in the private sector afterwards often changed their viewpoints substantially once they gained that experience, to the point that some even expressed regret at some of their prior positions. How far Left are they? On the democratic ticket we have the first and third farthest left senators. That is without excuse and has no redeeming value. They are moving to the right in their pre-election rhetoric but that is not reflected in their voting history so let’s chalk that up as an election strategy and nothing more. The last 45 years of perspective: Obama reflects the failed “no government is too big” policy of LBJ’s Great Society, which was based upon socialism and their notorious offshoots, and their resurrection under Jimmy Carter. He offers us nothing new. His political policies will take us in the same direction as those in decades past who led nations down the paths of National Socialism (NAZI’s), Communists, and other Marxist dictatorships of the past hundred years that led to the saddest events in world history and must be avoided in order to avoid similar consequences. The last 100 years of perspective: As far as the U.S. is to the left at the present time, one could draw parallels with the present day and pre-WWII Germany. The very short perspective and lack of historical knowledge is the reason why many among the population choose to ignore the obvious signs. It is incredulous that the ignorance of the lessons of history are tolerated to such a degree and the successful campaigning has resulted in such a blind-following of the democratic candidate. That unqualified and obviously disgruntled orator leads an emotion-based charge against all American patriots. What can you do? Don’t be seduced into voting for someone based upon their ethnicity or gender, that is a ploy. To obtain the best results remember that non-emotional political policies matter the most when choosing an elected official. Ask yourself the question: Since when did empathy and desire for the office become qualifications for the leadership of the free world? If elected Obama will weaken the country more than Leftist policies already have, which will make it that much harder to dig out in the future. The jeopardy continues to increase. Remember: not all change is positive. Palen: Since Obama and Palen are the two younger candidates they are often compared to each other. Nobody is perfect but considering the options there is no comparison, Obama is not in her league in any respect. SARAH PALEN’S KNOWLEDGE IS TRANSFERABLE TO ANY JOB REQUIREMENT ANYWHERE.